Posted on October 18, 2017	by chainsoff. 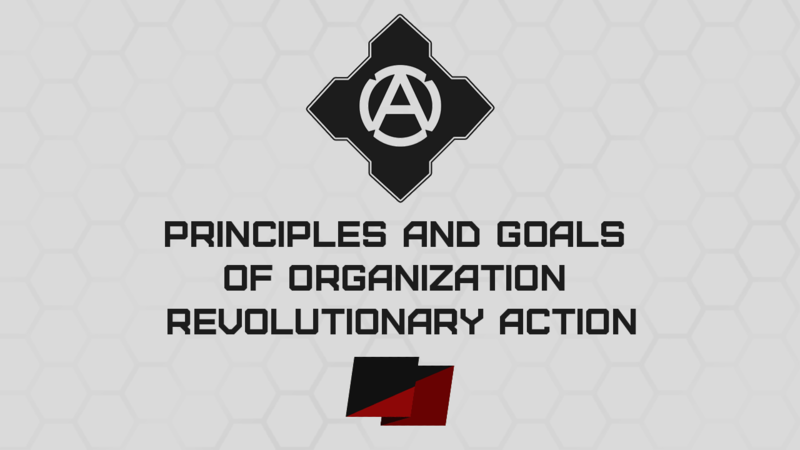 Revolutionary Action is an anarchist organization which unites active members of anarchist movement. Basis of RA’s ideas is anarcho-communism, social anarchism and illegalism. The voice of our position is the website and social networks, where we express position about different events, cover anarchist movement activity, publish instructions and recommendations. Materials published on the website can be created by our collective or by sympathizer volonteers. Organization is an editorial board of the website and it decides what material will be published. Revolutionary Action is an organization, because systematic, constant activity with planning, analysis and improving efficiency is necessary for movement development and approach of social revolution. It requires material, human and informational resources. Organization allows to distribute it such way, that organization members’ activity doesn’t stop on one direction, but spread on different practice as wide as it’s possible. 1. Coverage of anarchist movement’s activity and popularization of anarchist ideas in society. Website functions as speaker for radical part of anarchist movement. Organization members can take part in published materials and actions or not. Although website has editorial board, almost all sent on our email materials are published. We don’t publish only actions from political opponents, actions without media value and those, which can discredit anarchism by it’s format. RA’s editors reserve the right to make corrections to spelling, punctuation and correct grammatical mistakes and also to bring the text style into a more acceptable form, without changing the main idea or the message of the sent material. In addition to direct formatting and publication of news, the editorial board carries out the distribution of press releases in the other mass media, share actions and other materials with the help of social networks. 2. Creation of a strong, prepared and organized anarchist movement. Transfer of experience from generation to generation and personnel training:development from recruits to trained revolutionaries, which are able to solve a wide range of tasks the movement is facing with. Lack of transfer of experience from generation to generation is one of the most important reasons for the defeating of lots of promising movements in the past. Partly the website is used for these purposes, the same work is conducted also during direct interaction with the activists. The main emphasis is on the transfer of practical experience: from security issues to street actionism and radical practices. But it is also important to spread the ideological principles (anarcho-communism, illegalism) and strategic assessments (social revolution as the only way to achieve anarchist society) of organization as broadly as possible. The principle of concentric circles is used as the basis for practical work with activists and participants in social movements. 3. Aspiration of the organization to be a team of the best organizers and experts in the anarchist movement, standing on a close ideological platform. Those few persons who participate in the movement, regardless of political conjuncture and external conditions. Fanatics of the anarchism ideals. Revolutionary Action supports the synthesis of agitation and direct action. For the synthesis of work in the media field and work in the underground field. Working in a media field only without the possibility of radical struggle makes the movement weak and unable to respond to the challenges of the time. At the same time, going into deep underground will dampen the movement and make it’s impossible for the influx of those people which are interested in the anarchist movement and the realization of an anarchist society on practice. 4. Approximation of social revolution is the only way to establish anarcho-communist society worldwide. Establishing such society is a real task and final goal of organization. At the same time, the organization does not consider that such revolution is possible only by its efforts or by its acting as an avant-garde. We guess the cooperation with many other anarchic collectives around the world, with ideological positions close to ours, is possible. 5. Expansion – the organization is looking for the ways to its intensive expansion within Belarus and abroad. The Revolutionary Action is ready for international cooperation, exchange of experience and mutual aid. 1. Membership in organization is closed – no one outside organization should know it’s actual group members. Members of RA don’t advertise their membership in organization. 2. Distribution of duties exists in organization. Each member is responsible for certain tasks and perform several functions, that provide development of organization and anarchist movement. 3. Each member has equal voting rights. Revolutionary Action has fixed membership: activist can be accepted to the Organization or expelled from it. All decisions are made by collective discussion, strategic issues with consensus, tactical issues with voting if it’s necessary. 4. Planning is the key to successful revolutionary struggle. The using of various methods is justified by objective circumstances, profit for movement and development prospects, but not by personal preferences or esthetic attractiveness. So organization uses methods, which are the most useful at the specific moment. 5. Conspiration – organization is an semi-underground structure. Part of it’s activity isn’t published on the website or in mass media. 6. Illegalism – the organization carries out activities without regard for the legality of it. The main reason for the action is the its effectiveness, and secondary – if it is prohibited or allowed by law. Salute, dear comrades all around the world! 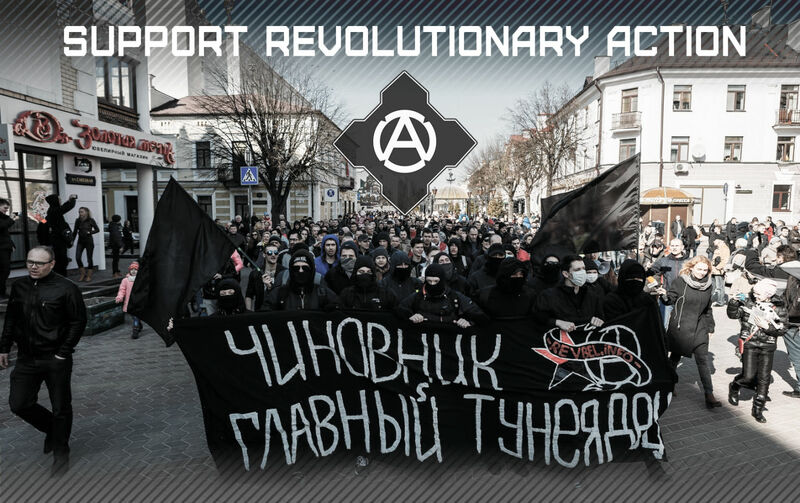 We are anarchists from the organization called Revolutionary Action from Belarus. Our main goal is anarchy worldwide, our main method to reach it is social revolution, our current activity is class struggle, agitation on the streets and the development of our own media. Our principles are: illegalism, anarcho-communism, revolutionary anarchism. We are close to neoplatformism practice, which was developed by the anarchists from Rio de Janeiro. We veil our names and the participation in the organization, we don’t sign any action with our organization name. Starting from February there has been the biggest wave of protests for almost ten years in Belarus. People of different ages and occupations went out and said their “NO” to Lukashenko and his dictatorship on the streets of their cities. The reason for these protests was the new tax for unemployed people, but people started to demand not only the abolishment of this tax: people were saying about big social changes. One of the main object of protesters’ critics was the police staff in Belarus. Belorussians are really tired of the special police that seize their neighbors and relatives. Belorussian people are tired of KGB, new aristocracy and the elite of Belorussian society, with their corruption and total control. Our collective supports the struggle of ordinary people for their rights. We think that the main recipe to win the battle against the police state are the organized and radical groups of people, which struggle on their places with different ways: workers with strikes, students with agitation and symbolic actions. And all of them with radical methods – from small group attacks to clashes with police on the streets. Our comrades at first took part and then headed the march in Brest on the 5th of March. We also tried to call people to protest more frequently on the 18th of March.We called people to join us in the protest on the 25th of March, which was brutally broken up by police forces. But, the state knows our position well and try to don’t give us any chance to send our message to people. Our main web-domain was blocked in Belarus (revbel.org). After that, police blocked our four mirrors (revbel.ga, revbel.info, revbel.net and revbel.cc), which were created for people, who don’t know how to use Tor or VPN. Also the government censored our main social network page and group in Russian social network called VKontakte (https://vk.com/rdbelarus and https://vk.com/revbelorg). Now it’s impossible to reach it from any Belarusian IP. Nationalists and politicians ignore our existence and activity. Their media don’t publish anything about our actions and calls – so we try to reach more people through social networks. Our comrades always have a chance to be arrested and sentenced to administrative arest (till 25 days) or even criminal sentences (Belorussian police can fabricate fake criminal proceedings and sentence people for maximum 3 years of prison for fake preporations for “mass disorders”). We started our own project, where people from Belarus can add any police officers, state propagandists, judges or bureaucrats with info about them. We are collecting the information about their addresses, telephone numbers, social network pages, photos and videos. The project is called Banda Luki (Gang of Lukashenko): https://bandaluki.info (only russian), now it’s also blocked in Belarus. We have also developed the application for Android to bypass the censorship and which uses Orbot, VPN or our mirror. It is avaliable now in Google Play in English. It’s rather a difficult period for our country nowadays. We need much more than our salaries can give us to win this battle with a well-armed police structure. This entry was posted in ANONYMOUS, Uncategorized and tagged DUCK DUCK GO, GOOGLE NEWS, YAHOO NEWS. Bookmark the permalink. 1 Response to UPDATED: WHEN BELARUS TALKS….